Although living in a town of only 35,000 sometimes had its drawbacks, something I found really refreshing about living in Úbeda this past school year was that there were virtually no chain restaurants (especially American ones), which forced me to patronize local restaurants and eateries instead of corporate carbon-copies. Okay, so there was a Telepizza, but that was it. 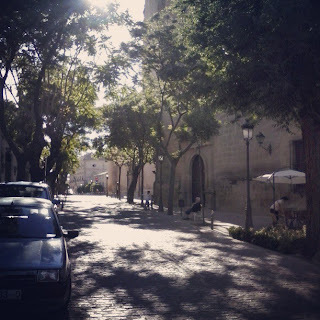 Eight months of hanging out with friends and going out for tapas later, and I think I may have formed an opinion or two about what places I like in Úbeda. In this post I’d like to follow the “48 Hours” guide popularized by publications like the New York Times and the Independent, but focusing solely on food. Get hungry! If you’re craving some chocolate con churros—long, crunchy donuts that you dip in molten chocolate—then Churrería ANPA is where you need to go. 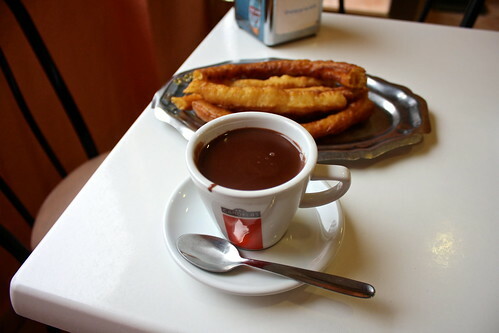 Nº 18 on the busy Avenida Ramón y Cajal (northeast of the Hospital de Santiago), this simple but popular churros joint is welcoming and serves ‘em how they’re meant to be: a heaping mound of fresh, hefty, handmade fried dough with thick, good-tasting chocolate. They also make a mean cup of coffee and great toast, too! Off a shaded, L-shaped street west of the bullring (C/ Cronista Pasquau) you can find the simply-named restaurant Bocata, “sandwich.” They basically serve the cheapest burgers and sandwiches you can find in town, and they’re great quality, too! The brightly-lit, white spacious seating area is perfect for chowing down on a bocadillo de tortilla y pimientos fritos—a huge Spanish potato omelet sandwich topped with pan-fried green bell peppers; hardly more than three euros! Next door is El Yelmo, named for the highest mountain in the nearby Sierra de Cazorla range. They serve massive free tapas with whatever you get to drink, often half a baked potato with garlicky aioli sauce or sliders of green peppers and pork loin. The cozy interior is decorated with faded photographs of wildlife and the landscape of the mountains to the east. If you walk east past the historic center’s Plaza Vázquez de Molina, you’ll end up on C/ Baja del Salvador, which comes to a T at the Santa Lucía lookout point. At this scenic corner is Café Tapería El Mirador, which occupies a generous terrace with grand views of the surrounding hills. I liked to come here on winter afternoons and warm up with a Cola-Cao (Nesquik-style hot chocolate powder in steamed milk). But seriously: most stunning views in the province just yards away. Museo de la Tapa, C/ Alonso de Molina Nº 6 across from the Mercadona supermarket, means “Museum of the Tapa,” and if I remember correctly, has about a hundred (100!) 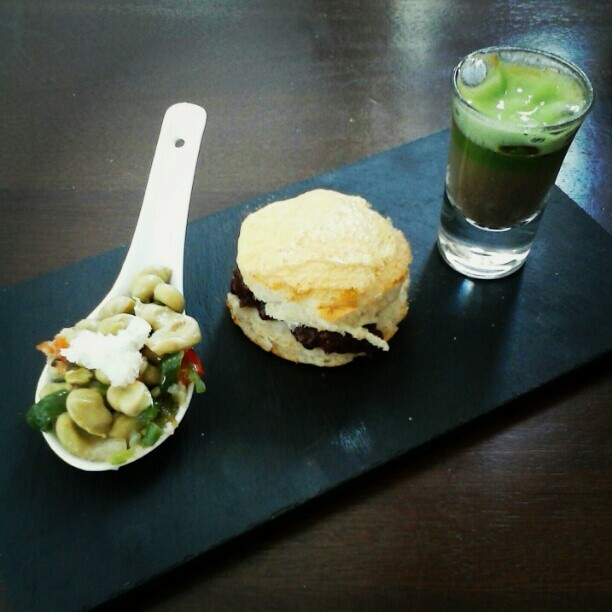 different tapas you can choose from that come free with your drink order. At C/ Victoria Nº 32, the aptly-named Bar Cervecería Victoria faces the old north wall of the Hospital de Santiago. This is a great place to come to at dusk, get something to drink (ask for the complimentary olives—best in town! ), and maybe order a ración or two (appetizers). Come early, as tables in this tiny place fill up fast! If you head north out of the Plaza de Andalucía along C/ Trinidad, you’ll soon find Fogón de Nieves, set in a tiny plaza at the end of C/ Caballerizo (it’s Nº 24). This clean and fresh bar-restaurant is just a few minutes’ walk from where I used to live, with a friendly husband-and-wife team who serve fresh, tasty tapas in their quiet, trendy dining area. Cafetería Pastelería Anaga, an orange-and-blue setup on C/ Obispo Cobos (the main shopping drag), is a fine place to get a café con leche (basically a latte) in the morning with a pastry or a media tostada con tomate, Andalusian-style toast with olive oil and grated tomato. Ibiut, down the street from the Plaza 1º de Mayo, takes its name from a now-demolished old castle tower on the edge of town. But their cooking is hardly ancient; inside the cool, airy dining area you can try creative takes on old favorites. Just around the corner from the bus station at Avda. Cristo Rey Nº 8 is Café Suizo, the place where all the cool kids go to hang out during the coffee hour, the period of time after siesta is over and people flood the streets once again for a pick-me-up coffee or other beverage of choice. By six o’clock p.m., this place is hoppin’ and the streetside terrace is packed! I’ve saved the best for last. A few minutes’ walk due south of the Hospital de Santiago you can find the Museo Agrícola on C/ San Cristóbal Nº 17, also called La Posada de Úbeda. A combination restaurant, hotel, and agricultural museum, this fascinating place has collected probably thousands of farming implements and tools that cover almost every square inch of free wall space inside. After passing through a cozy, wooden bar area, you walk down a few steps into the tall covered courtyard where all the dining tables are. Fancy but without being too upscale, this is a great restaurant for a more special occasion. I stayed four nights in an affordable hotel room here while apartment-hunting and was warmly welcomed into Spain by the friendly owners. 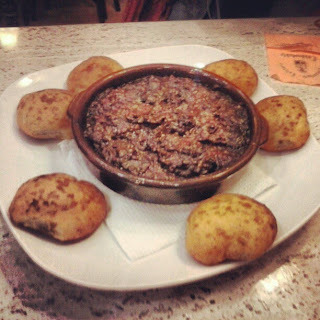 The most unique food of “La Loma” (the area surrounding Úbeda) is ochíos con morcilla. Ochíos are little bread rolls colored orange by their paprika-and-salt glaze. They’re sliced in half and typically eaten with a healthy dollop of morcilla en caldera, or blood pudding paté. I’ll admit this actually sounds pretty disgusting but the flavors are incredibly savory and fascinating. 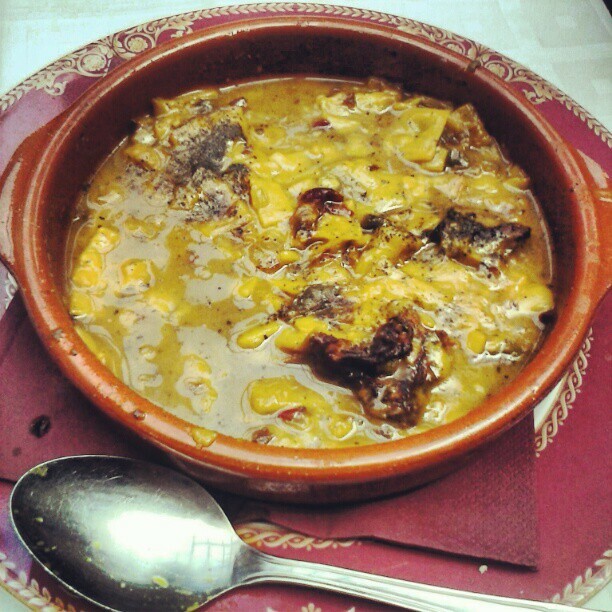 Andrajos is a hearty, lime-green-colored stew of clams, rabbit, vegetables, spices, and thick noodles. If you’re looking for some comfort food, this is it. Although hardly specific to Úbeda, migas or fried breadcrumbs are also a great choice. They sound even better after you learn they’re cooked with sausages, red bell peppers, and lots of garlic. In a sleepy corner of the casco antiguo or old town, you can find a convent of Carmelitas Descalzas nuns (“Barefoot Carmelites”) on C/ Montiel, which is due south of the Mercado de Abastos. Within a windowless antechamber you can place an order for all varieties of sweets and cookies: talk to the revolving door, leave the cash required for your total on the shelf, and wait for the cloistered nuns to return the best desserts in town. 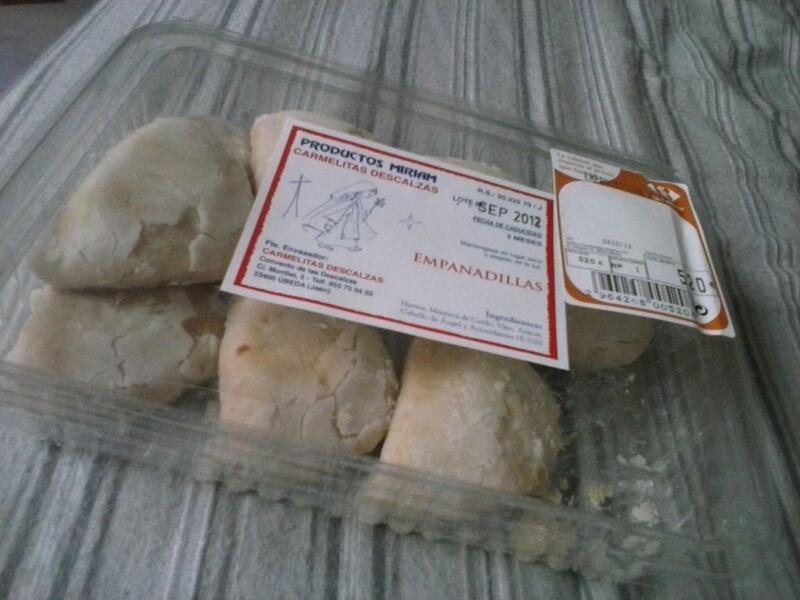 My favorite are the empanadillas, floury little turnovers with transparent, chewy fruit filling. The spring months from April through June are high Snail Season here in southern Spain, and people go crazy over caracoles a la andaluza, Andalusian-style snails. Slow-cooked in a rich, spicy broth, they’re served in small glasses or bowls with toothpicks—yes, so you can pick the little guys out of their striped shells before chowing down. Or you can just SLURP! them out, washing them down with a healthy swig of the savory caldo (broth). 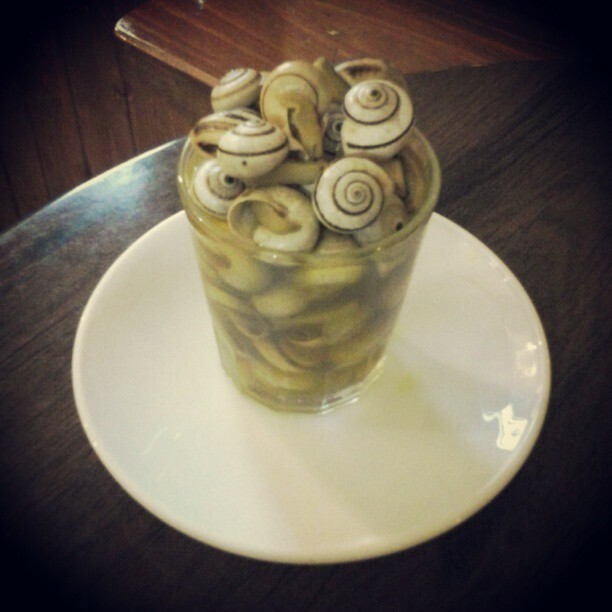 My favorite place to partake in this seasonal dish is Cervecería Los Buñoleros on C/ Torrenueva Nº 14. In the new part of town along the main artery heading north from Plaza de Andalucía, this lively tapas bar is so famous for its food that its logo replaces the dozen lions in the town’s coat of arms with snails. I’ve made a fancy new interactive Google Maps Engine map with all these cafés, restaurants, and more you can check out here! Which of these restaurants sounds most appealing to you? And more importantly, are you hungry yet?! Comment below!